Leading Manufacturer of flexible magnets from Surat. We are engaged in offering Flexible Magnets for environmental protection. These couplings are based on magnetic technology and are manufactured using superior quality raw material. To ensure the protection of environment, leakage-proof torque transmission is widely demanded in process technology. For pumps and agitators, highly toxic and aggressive media are required hermetically sealed drives. Flexible Magnetic Sheeting: Flexible Magnetic Sheeting, flexible magnet is produced with the calendering process. It is normally used in office appliance, advertising, checking and testing. 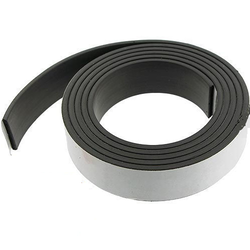 Flexible Magnetic Extrusions, Flexible Rubber Magnets : Flexible Magnetic Extrusions, flexible rubber magnet, Flexible Magnetic Strips and Custom Profile are thermoplastic permanent magnetic Extrusions. It can provide superior holding. Flexible Magnets For Micro-Motor : Flexible Magnets for Micro-Motor are thermoplastic permanent ferrite magnets with Enjoying characteristics of satisfactory magnetic property, mechanic property, chemical corrosion resisting Property. Film-Covered Magnets: Film-covered magnet is Laminated Flexible magnets adhered to various kinds of PVC. PP, double-sided tape. The colors of films are various. It is normally used on teaching-aid, children toys and gifts . Looking for Flexible Magnets ?